Honduras – Let’s go again! The highlight of each new year is returning to Honduras with Rotarians from District 6760 and friends. We will spend one week in the Choluteca region of southern Honduras. We will visit many friends we have come to know over the years, and meet many more! This year, our group will bring electricity to a total of 68 families. In the Las Delicias village near San Marcos De Colon, we will complete service for 22 homes. During this time, we will stay at one of our favorite hotels – The Hotel Barcelona in San Marcos De Colon. After the work is finished there, we will move to the Rivera Hotel in Choluteca and complete the wiring for 46 homes in the village of Tapaci, just outside of El Jocote, which we “electrified” in 2008. 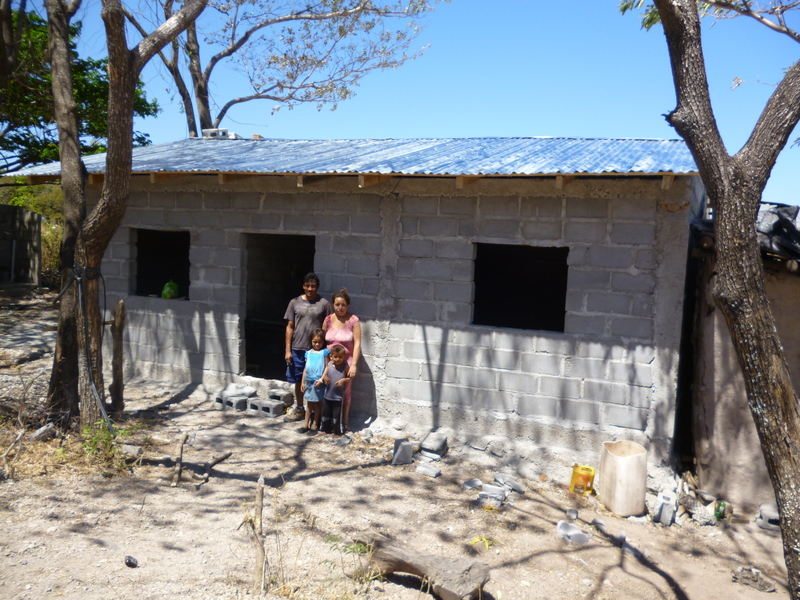 Last year, our project was to build a home for the family of Mario Sandoval and Dania Osorto. Windows and doors have been installed since we were there and I look forward to posting those pictures when we return. Here is Mario, Dania, Daniela, and Mario Jr. in front of their new home. Honduras is a place where everything makes a difference in someone’s life. Every minute spent, every penny collected, every tear shed, every dollar donated. Many that are unable to visit in person have made generous donations to our club for humanitarian efforts while we are there. Needs are plentiful there, but resources are scarce. We may not be able to help everyone at one time, but we have helped many – one at a time. Back in 2007, a co-worker and friend Rob Calk slipped me $200 cash a few days before we left. He said “do something cool with it” and left it at that. On the way to our project each day, we passed a very “run-down” house, bound together with plastic tarps and cardboard. Adjoining this “house” was a foundation for a new home similar to above, and that work had been abandoned. We stopped and learned that the single mom and 4 kids were all alone. Their Dad had been killed earlier in the year. He had started a new home for them, and those hopes left with his death, until she could save the money to continue construction. In our best attempt at Spanish, we asked the mother what it would cost to finish the house. She knew exactly the cost of the supplies she needed, and said she had neighbors that would help her with volunteer labor. She answered with the figure in Lempira, Honduras currency unit. After running a few calculations, she needed $200 USD. Unbeknownst to Rob, he had just financed the completion of a home in Honduras! The following year, we rode down this path….a completed house stood where the abandoned foundation had been just one year before. The former house was now being used for storage and chickens. The house had obviously won out over the party. I do have before and after pictures, but just cannot find them to post. Rob did get to see both, by the way! The family was most appreciative too, and yes they remembered us immediately! This year will identify more needs that we will address. If you would like to donate a few discretionary bucks, just let me know as we leave Friday morning, February 1, 2013. We promise that donations will not be spent on beer! I can’t wait to document this year’s trip when we return, and also to share the news of another amazing story – a story how a young child from Honduras will be admitted to Vanderbilt Children’s Hospital for major surgery upon our return – thanks to the efforts of Middle Tennesseans involved in our projects! As of today, he and his mom have received their medical visas for the trip. More to follow. Until then, we’ll be down there doing what we can to help – one family at a time! This entry was posted in About Rotary International, It is NOT about Real Estate :0), Life in Honduras, Travel and tagged Barcelona Hotel San Marcos de Colon, Choluteca, Dania Osorto, El Jocote, Las Delicias, Mario Sandoval, Rotary Club of Spring Hill & Thompson Station, Rotary District 6760, San Marcos de Colon, Tapaci, Vanderbilt Childrens Hospital.